Behind The Solomon Cutler pub on Broad Street is Regency Wharf, which is home to a couple of eateries including Blue Mango Indian restaurant. We were asked to check out their offering, so dragged a few friends along for a pre-Christmas Indian. It’s a fairly large family restaurant broken up by wooden railings and differing levels. Dining on the night we were there were families with children, guys out on the beer, and other random groups of friends. It’s not overly loud like some dining rooms can be, and we were able to have an animated conversation over the generously sized decoratively inlaid table. Obviously we had to have poppadoms while we reviewed the menu, and they included the cone shaped ones that are utterly hot and spicy. The dips alongside them also contained a chilli heated raita with a real kick, and a sour mango chutney. 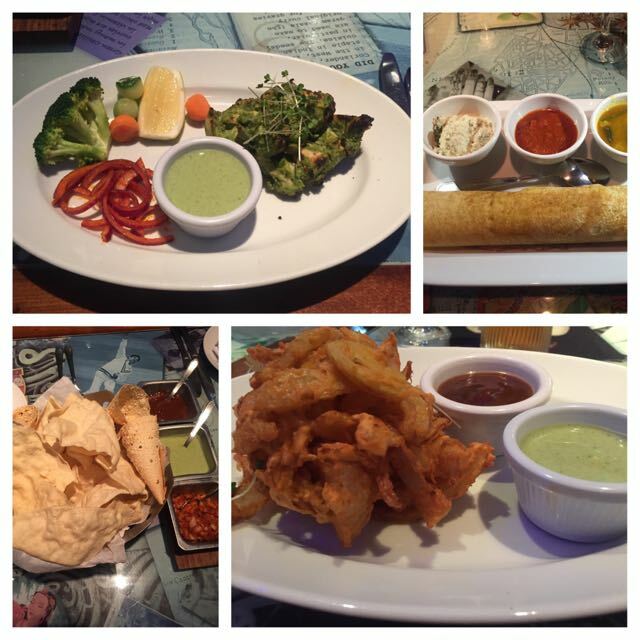 For starters we tried the onion bhaji and the Dosa. You’re no doubt familiar with onion bhaji, and this was a particularly good version of it – spicy and crisp light batter, not at all cloy, with big chunks of mild onion. 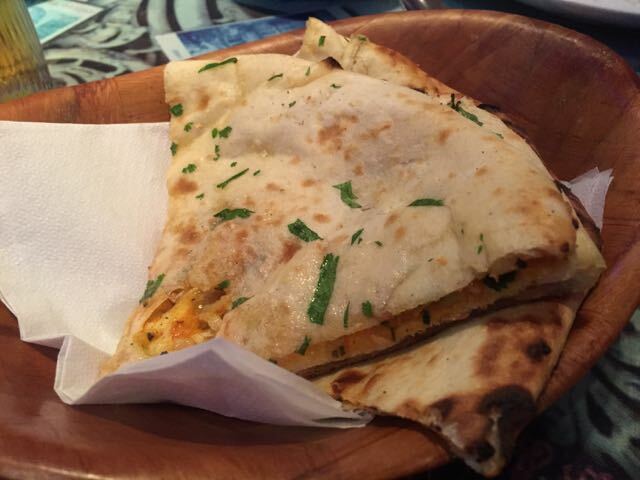 You may not have had Dosa before, I think it’s best described as looking like a rolled french crepe. However they’re made from rice flour rather than wheat flour and they’re rolled and stuffed with a spicy sour vegetable or chicken curry – I opted for the vegetable version as I sometimes find Indian food to be very heavy, and that the veggie versions are equally as tasty and lighter. I very much enjoyed it and will definitely be having Dosa again. For mains I had the Kori Gassi, a chicken curry with grated coconut and coriander seeds, – very enjoyable. We tried the chicken Dum Ki Biryani, which was flavoursome although lacked the promised garlic in the accompanying raita and vegetable curry. The curry was very smooth, I think I prefer the more normal version with chunks of vegetables. 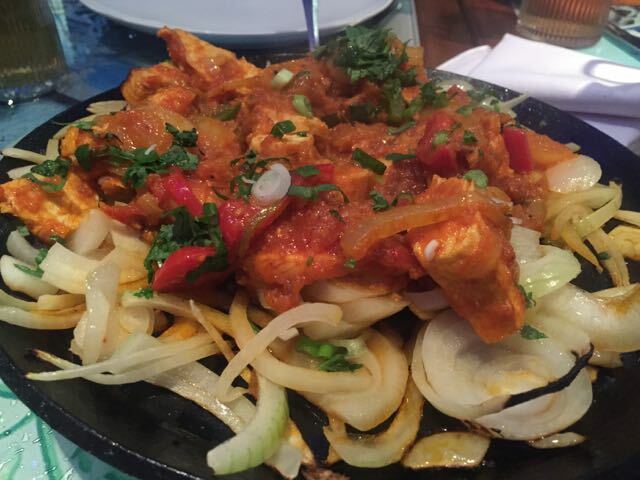 We also had the Masala Gosht Tak-A-Tak, that’s a dish of lamb served on a bed of onion on a sizzling iron plate. I think this was really the only disappointing dish of the ten we tried, which isn’t bad odds – it was a little bland we thought, certainly compared to the chicken version of the Tak-A-Tak which we also tried. At this point of the evening I managed to tip a spoonful of orangey red food down the 2 inches of white fabric on my top, and then spent 20 minutes in the gent’s trying to rescue it! The service was leisurely but pleasant, perhaps a little slower than we’d usually expect, but it was full of very large groups and we were kept well watered so we had a good time catching up. We washed down our meal with the usual – Cobra beer – but they also often wine, and unusually for an Indian restaurant on this price point, a cocktail list. probably less than £35 for two people for two courses with sides. See our reciprocity promise, as we did get a couple of plates free. This entry was posted in Area: Broad Street, Cuisine: Indian, Price: Average, Venue type: Restaurant and tagged Birmingham Restaurant, birmingham restaurant review, birmingham review, eating out in birmingham, Out In Birmingham, out in brum, OutInBrum, restaurant review, where to eat in birmingham, Where To Go In Birmingham, where to go out in birmingham. Bookmark the permalink.